Editor's Note: Sometimes the simplest word can have a profound impact in the lives of pilots. NIGHT is one such word. The following nighttime safety tips provided by Adrian Eichhorn highlight the importance of the word N.I.G.H.T. The FAA Aviation News safety staff hopes you enjoy this interesting play on the word and heed its message. In today's complex world of GPS, glass cockpits, and flight management systems, sometimes a simple rule of thumb or memory aid is still the best way for a pilot to avoid an accident. After a lot of work, I think N.I.G.H.T. is one such flight planning aid pilots should use before every night flight. Night flight has certain inherent risks. After a friend was killed in a nighttime accident, I started reviewing all the information I could find relating to night flying accidents including various safety recommendations. In summarizing my research, I think the five most important questions a pilot can ask or review before a night flight is contained in the acronym N.I.G.H.T. Each letter asks a question or relates to a topic that I think a pilot should consider before every night flight. The five simple letters stand for five critical issues that address important operational issues, potential hazards, or physical limitations'topics unique to night flight. NOTAMS - did I check local NOTAMS? When it comes to NOTAMs, you don't know what you don't know! NOTAMs are classified into three categories: NOTAM (D) or distant, NOTAM (L) or local and Flight Data Center (FDC) NOTAMs. If your flight is to a distant airport, the NOTAMs you receive typically will include information on navigational facilities, frequency changes, and regulatory amendments. But, it will not include information contained in local NOTAMs. For instance, local NOTAMs include such information as runway or taxiway closures and airport lighting outages. A total or partial outage of a Visual Approach Slope Indicator (VASI) or Runway End Identifier Lights (REIL) system also will be reported as a local NOTAM. The only way to obtain a local NOTAM for your destination airport is to call the FSS responsible (see Airport/Facility Directory) or to call the airport manager. Illusions - have I considered them? Many different illusions can be experienced in flight; some can lead to spatial disorientation while others can lead to landing errors. Illusions rank among the most common factors cited as contributing to fatal accidents. Illusions Leading to Spatial Disorientation. Various complex motions and forces and certain visual scenes encountered in flight can create illusions of motion and position. Spatial disorientation from these illusions can be prevented only by visual reference to reliable, fixed points on the ground or to flight instruments. For more information on the illusions such as: Coriolis illusion; Graveyard spiral; Somatogravic illusion; False horizon; Auto kinesis; Elevator illusion and the Inversion illusion, Refer to Chapter 8 of the Aeronautical Information Manual (AIM). Runway width illusion. A narrower than usual runway can create the illusion that the aircraft is at a higher altitude than it actually is. The pilot who does not recognize this illusion will likely fly a lower approach, with the risk of striking objects along the approach path or landing short. A wider than usual runway can have the opposite effect, with the risk of overshooting the runway. Runway and terrain slopes illusion. An up-sloping runway, up-sloping terrain, or both, can create the illusion that the aircraft is at a higher altitude than it is actually is. The pilot who does not recognize this illusion will actually fly a lower than normal approach. A down-sloping runway, down-sloping approach terrain, or both, can have the opposite effect. Featureless terrain illusion. An absence of ground features, as when landing over water, darkened areas, and terrain made featureless by snow, can create the illusion that the aircraft is at a higher attitude than it actually is. The pilot who does not recognize this illusion will fly a lower approach. Atmospheric Illusions. Rain on the windscreen can create the illusion of greater height, and atmospheric haze can create the illusion of being at a greater distance from the runway. Ground lighting illusions. Bright runway and approach light systems, especially when few lights illuminate the surrounding terrain, may cause the illusion of less distance from the runway. A pilot who does not recognize this will fly a higher approach. Conversely, the pilot over-flying terrain which has few lights to provide height cues may make a lower than normal approach. Glide slope -is one available? Check to see if a visual or electronic glide slope is available before departing to your destination. Although visual glide slope indicators are installed at most airports, it's important to note that they may be installed at only one runway end. Also, there are many variations. Some of the not-so common indicators include the Tricolor System, Pulsating System, Alignment of Element System, and the Three-bar VASI. Tri-color System. Tri-color visual approach slope indicators normally consist of a single light unit projecting a three-color visual approach path into the final approach area of the runway upon which the indicator is installed. The below glide path indication is red, the above glide path indication is amber and the on glide path indicator is green. These types of indicators have a useful range of approximately one-half to one mile during the day and up to five miles at night. 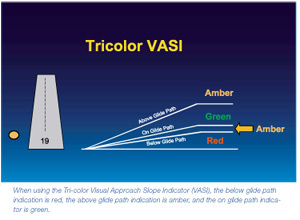 Note: Since the tri-color VASI consists of a single light source that could possibly be confused with other light sources, pilots should exercise care to properly locate and identify the light signal. Pulsating Systems. Pulsating visual approach slope indicators normally consist of a single light unit projecting a two color visual approach into the final approach area of the runway upon which the indicator is installed. The on-glide path indication is a steady white light. The slightly below-glide path indication is a steady red light. If the aircraft descends further below the glide path, the red light starts to pulsate. The above glide path is a pulsating white light. The pulsating rate increases, as the aircraft gets further above or below the desired glide slope. The useful range of this system is about four miles during the day and up to ten miles at night. Alignment of Element Systems. Alignment of elements systems is installed on some small general aviation airports and is a low-cost system consisting of painted panels, normally black, white or fluorescent orange. Some of these are lighted for night use. The useful range of these systems is about three-quarter mile. Three-bar VASI. 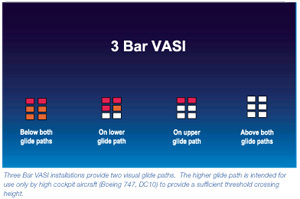 Three bar VASI installations provide two visual glide paths. The lower glide path is normally set at three degrees while the upper glide path, provided by the middle and far bars, is normally 1/4 degree higher. The higher glide path is intended for use only by high cockpit aircraft (Boeing 747, DC10) to provide a sufficient threshold crossing height. Note: although normal glide path angles are three degrees, angles at some locations may be as high as 4.5 degrees to give proper obstacle clearance. 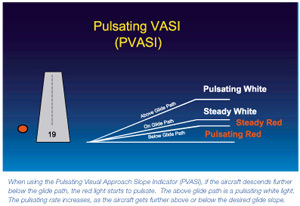 Pilots of high performance aircraft are cautioned that use of VASI angles in excess of 3.5 degrees may cause an increase in runway length required for landing and rollout. How do I control lighting systems? Operation of airport lighting systems (rotating beacons, approach lights, VASI, REIL, taxiway lights and runway lights) may be controlled by the control tower, a Flight Service Station (FSS) or by the pilot with radio control. On runways with both approach lighting and runway lighting (runway edge lights, taxiway lights, etc.) systems, the approach lighting system takes precedence for air to ground radio control over the runway lighting system. Note: Although the CTAF is used to activate lights at many airports, other frequencies may also be used. The appropriate frequency for activating the lights on the airport can only be found in the Airport/Facility Directory or on a standard instrument approach procedures publication. It is not identified on the sectional charts. Terrain - how do I avoid it? Avoiding terrain at night is easier if altitudes shown on VFR and IFR charts are used as part of your preflight planning. 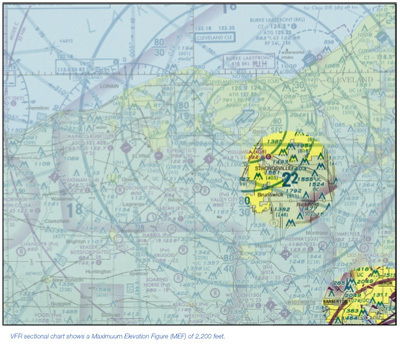 VFR Charts show Maximum Elevation Figures (MEFs). The Maximum Elevation Figures shown in quadrangles bounded by ticked lines of latitude and longitude are represented in THOUSANDS and HUNDREDS of feet above mean sea level. The MEF in the chart above is 2,200 feet. MEFs are determined by rounding the highest known elevation within the quadrangle, including terrain and obstruction (trees, towers, antennas, etc) to the next 100 foot level. These altitudes are then adjusted upward between 100 to 300 feet. Recognize this could give as little as 101 feet of obstacle clearance. Note the highest antenna on this sectional segment is 2,049 feet. IFR en-route low altitude charts contain Off Route Obstruction Clearance Altitudes (OROCA). On the IFR en-route low altitude chart, the Off Route Obstruction Clearance Altitude (OROCA) guarantees 1,000-foot obstacle clearance in non-mountainous terrain and can be used at night to ensure obstacle clearance. In mountainous terrain, this altitude offers 2,000 feet of obstacle clearance. Adrian A. Eichhorn is 7,000-hour pilot for the FAA. He is a volunteer Aviation Safety Counselor, a NAFI Master CFI, and the 2001 National Safety Counselor of the Year. He also holds an Airframe & Power plant certificate with inspection authorization (IA).